Pragmatic Play brings the Queen of Gold to EasySlots. Win gold and live like an Egyptian after playing the Queen of Gold slot that offers players a 3x5 reel with 25 pay line. Win multipliers are available throughout this slot, with a win multiplier reel you could increase your win by 100x in the super level. This slots on line has a lot of ways to make players become the Queen or King of Gold. 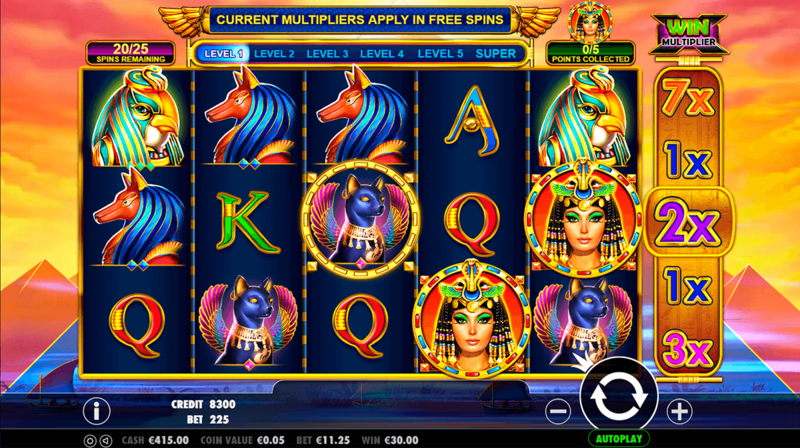 Egyptian themed slots are one of the most popular and can sometimes become mundane and boring, however, the bonuses available and graphics used in this slot make it stand out amongst other slots on the market. Pragmatic Play is one of the fastest growing providers of digital casino games for mobile and devices in the iGaming industry. Striving to provide engaging, memorable and innovative gaming experience, Pragmatic Play now have over 80 slot games. Their high-quality graphics, animations and themes help the developers to be one of the best in the industry. With titles including Pixie Wings, Hot Safari and Queen of Gold, they ensure they’re products use the latest, cutting-edge technology and integration. Play slot games uk now! 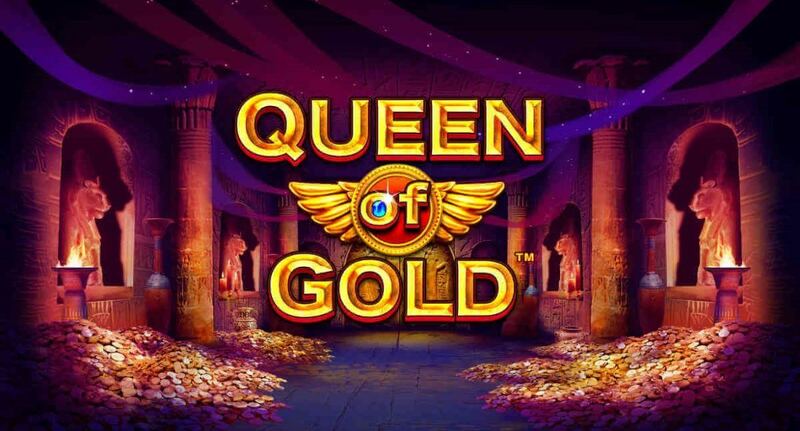 The Queen of Gold slot has a simple and classic gameplay however the unique multiple elements adds an extra dimension to this Egyptian themed slot that is definitely worth a spin. The design of this slot is very appealing to the eye, with bright and vibrant colours, detailed graphics and well-themed symbols. The symbols include playing card symbols (J, Q, K, A) and the famous and beautiful Cleopatra, Anubis, Bastet, Horus. The wild symbol is the sarcophagus of Tutankhamun which will replace all other symbols, other than the scatter symbol, to help form winning combinations. The scatter symbol is the blue shining pyramid ‘bonus’ symbols. Landing 3 of these symbols trigger free spins with the number of multipliers according to the multiplier reel 6 on all wins during the free spins. The unique feature of this slot is the extra, 6th reel. There are 5 main reels that work normally and there is also an additional WIN Multiplier reel. This reel spins with every spin of the game, giving players a chance to win extra boots on every win in the normal game. As players progress through the game, the multiplier reel will increase and offer bigger multiples to a maximum of 100x. Players need to collect points to increase the level of the WIN Multiplier reel. Collect points by anding 5 Cleopatra symbols in the golden hoop. The Joker symbol can also increase the WIN Multiplier if it lands in reel 6. As the WIN Multiplier reel offers so much multiplier potential, the other symbols, in the remaining reels pay out small prizes in comparison. 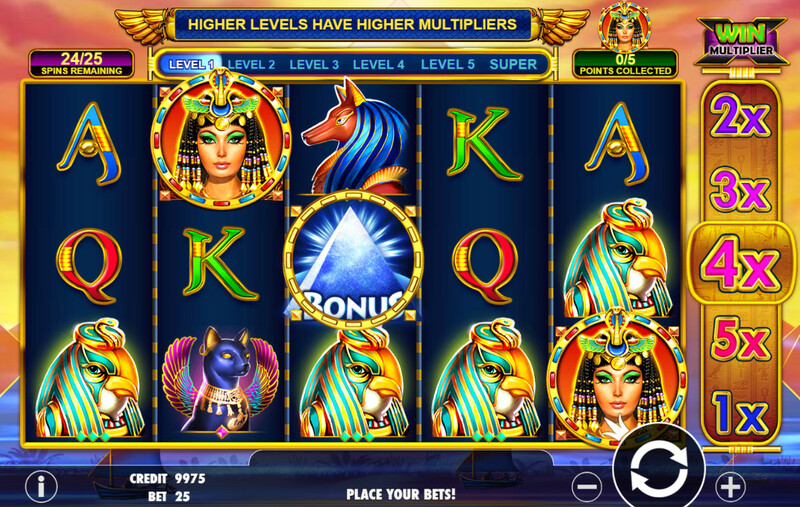 The biggest win on offer is the Cleopatra symbol which can reward 200x multiplier for landing 5 symbols on a pay line. Bet as little as 25p per spin to try the WIN Multiplier reel and hope to win big to become the new Queen of Gold. Read more about how to pay by mobile slots. The WIN Multiplier reel is the main attraction to the Queen of Gold slot, along with the beautiful graphics and colours. If you enjoy unique features and Egyptian themed games, try Queen of Gold today. If you enjoyed Queen of Gold why not try another online slots here on Easyslots.com.